The struggle to manage employees has been solved with the introduction of WPHRM, the comprehensive WordPress HR management suite that will send your business soaring with huge savings in both time and money. Developed for startups and small/medium enterprises, WPHRM allows you to quickly manage employee data, such as personal info, attendance, salary records, leaves, holidays, and much more. You’ll discover instantly how effortless it becomes to manage your business through our beautifully simple WordPress interface. Originally sold on CodeCanyon, but now only found exclusively on WPHRM.com to provide faster and better support, custom features, and one-click updates directly to your WordPress dashboard! Created by the programming gurus of Ommune, a top-rated software development team with a perfect 5-star rating on Freelancer.com based on over 600+ reviews! Enjoy the simplicity of department management to separate tasks between teams and delegate efficiently. Add employee job titles within each department for even better organization. With all your employees in one simple-to-use dashboard, miscommunications become a thing of the past. Employee information such as personal info, bank details, emergency contacts, and much more now resides all in one place. You can even add your own custom fields. Kickstart attendance every day using the bulk attendance control and quickly swipe through past logs to solve discrepancies. Ditch the paper and pencil and mark bulk attendance with just a few clicks, or completely automate it and enable Auto Mark Attendance. Receive timely in-dash notifications whenever an employee sends through a leave request; then approve or deny in 1 click. Our exclusive half-day attendance marking feature provides dead-on accuracy or total days spent in leave. Employees enjoy the ability to request leave for a half day on the same day. Generating salary slips is a piece of cake with our PDF processing tool that allows you to customize your slip just how you want it. Employees can request salary slips whenever making manual calculations a whisper of the past. Keep work separated from your personal email with in-dash notifications for both admins and employees whenever leave requests and reports are generated. Stay updated with the latest notifications pushed by your employer. Skip the accountant with WPHRM’s itemized finance management tool to instantly generate monthly and yearly reports for incredibly easy analysis. Sharing your work responsibilities with colleagues when you’re on leave is as simple as creating a user role and assigning that role to your peers. A simple menu allows you to select various roles. Benefit from 1-click updates and get quick and detailed responses to all inquiries. 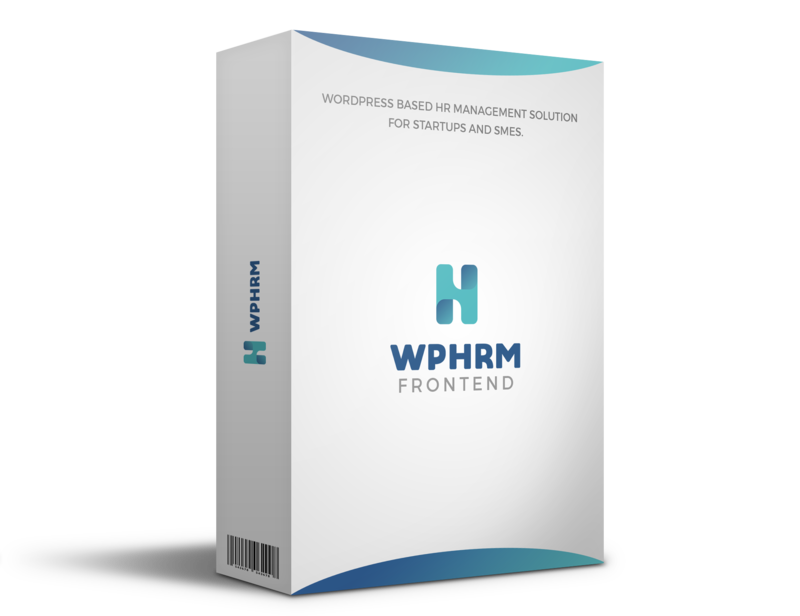 WPHRM Frontend was thoughtfully designed for employees, giving them a simple and intuitive interface that integrates seamlessly with your WordPress website. Not everyone in your company is going to be familiar with the workings of WordPress, and even if they are, who wants to see the boring WordPress dashboard every day? To solve this issue, we’ve come up with the Frontend Login, which provides a more attractive interface for both employee and employer. Find out for yourself why many of our customers tell us that WPHRM is the best thing to happen to their business. View our pricing models below and find the option that best integrates with your business. If you’re a startup, brand new to WordPress, or you don’t want to switch entirely to WordPress, you MUST check out our cloud hosting prices.